Labour has pledged to consider making serious exploitation of migrant workers a criminal offence if it gains power. Shadow home secretary Yvette Cooper said the existing offence of forced labour should be revised so more offenders are caught and prosecuted. Minimum jail sentences for employers hiring illegal workers on a large scale is one option that will be considered. 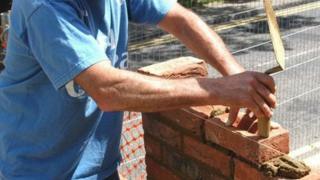 The government is doubling the maximum fine for employers found using illegal workers to £20,000 from next month. Other measures introduced by the Conservative-Liberal Democrat coalition include a four-fold increase in fines for firms not paying the minimum wage and increased penalties for landlords housing migrants in illegal premises. But, Ms Cooper has claimed that current laws were failing to deter serious exploitation of migrant labour. She told BBC Radio 4's Today programme that exploitation attracted low-skilled migrants, when the UK should actually be trying to attract university graduates. "When we've got employers getting away with this kind of shocking abuse, that undercuts local wages, it also undercuts responsible businesses," Ms Cooper said. She and shadow business secretary Chuka Ummuna launched on Thursday a nationwide consultation with businesses, trade unions, communities and workers into the laws on exploitation and undercutting of wages. Currently, employers convicted of knowingly employing a significant number of illegal workers face jail terms of up to two years and an unlimited fine. But according to Labour, fewer employers have been fined for employing illegal immigrants since 2010 and £40m of fines have gone uncollected. The shadow home secretary told the Today programme that illegal migration, public concern, and the fact there were fewer university students coming from overseas into the country were all problems. "We are in danger at the moment of having the worst of all worlds," she said. As well as exploitation of migrant workers, Labour pledged to tackle the issue of temporary student visas. Ms Cooper said the visas were a big concern because they had few checks on them. She said people travelled to the UK on these temporary student visas, started working and then "outstayed" them. "We think that should be stopped. There is a huge amount of abuse around these temporary student visas. There should be a big clampdown on that," Ms Cooper said. "There should be fewer people coming in on those visas, but at the same time we should be doing more to support the university graduates where we have seen the numbers drop for the first time in 30 years." The shadow home secretary also called for "stronger restrictions" on the benefits system, saying migrants should not be able to make claims when they first arrive in the country. "When people go to work in other countries in Europe they don't expect to be able to claim benefits as soon as they arrive and likewise, I don't think people should expect to when they come here," Ms Cooper said. "I think that's a fair system. It's what happens in lots of other countries, it's what happens if people come from other countries outside the EU. This is about having a fair, sensible, responsible approach to immigration, not an arms race in rhetoric, but practical policies instead." In her speech outlining a future Labour government's approach to immigration, Ms Cooper also committed to reintroducing full exit checks at UK borders - scrapped by the previous Labour government - as well as to take the fingerprints of illegal immigrants caught at Calais. Labour has been criticised for allowing levels of annual net migration to shoot up after 2004 - when it did not insist on any controls on workers from Poland and 10 other new EU member states entering the UK. Acknowledging past mistakes, she admitted the figures were wrong, and that migration was far greater than the party expected. "As a result the pace and scale of immigration was too great and it is right to bring it down," she said. "And we should have recognised more quickly the impact on low-skilled jobs, and the worries people had." The Conservatives hope to cut annual net migration to under 100,000 by next year but the latest figures show that it actually rose by 60,000 to 210,000 in the year to September 2013. Ms Cooper said migrants have made an "immense contribution" to British society and its prosperity. "It [immigration] is not all bad, as conservatives would tell us. It's not all good, as liberals would tell us. "In the world economy, immigration is important for our future so we don't turn away the best talent and investment Britain needs. "That is why immigration needs to be properly controlled and managed, and why stronger controls are needed to tackle problems and build public confidence and consent." Ministers announced on Wednesday that the Gangmasters Licensing Authority would become part of the Home Office - a move it said would strengthen its enforcement and intelligence capabilities.